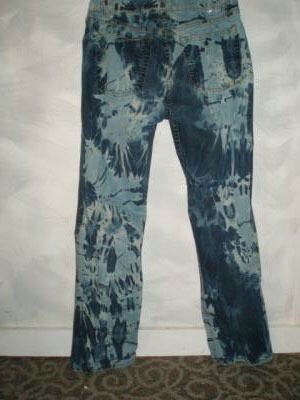 You can fade dark jeans for an overall lighter look or spot bleach for a reverse tie dyed appearance. This is a guide about fading dark jeans. Make your jeans into a fun fashion statement. Make the most unique jeans around! Jeans are tied, scrunched, folded and secured with rubber bands, soaked in bleach and hot water. Approximate Time: 15 to 30 minutes in the bleach, wash and dry done! Wash jeans and dry with no fabric softener or sheets. Fold jeans, twist, and tie with rubber bands. There is no set way to do this, but I kept twisting, securing with bands folding securing with more rubber bands. No two will be alike and it is similar to tie dyeing, only with bleach. Place the jeans in bucket with half hot water and half bleach, soak and turn, push around for 15 minutes. Pull back a band and see what's happening. I left mine in 1 hour, use your own judgment. Rinse and place in washer and dryer. I have also done this project using the bleach as "paint". Apply it with an old paintbrush and you can create whatever designs you want. I did this with some colored t-shirts a few years ago and they looked really cool!! Only thing tho, it weakened the fabric considerably where the bleach had been. Soon started developing holes and rips in those places. It should take a lot longer on jeans tho!! Cute idea!! I used to buy a product called Soft n Fade. I have looked in many stores and can't find it. I can't find it on the internet either. It's a boxed powder that you pour into the washer and just wash your jeans. When done they are very soft and at least two shades lighter. I saw a box of it a few weeks ago, but I don't remember where. Now I need it and can't find it. Can you help? It seems this product has disappeared and many people are looking for it now. 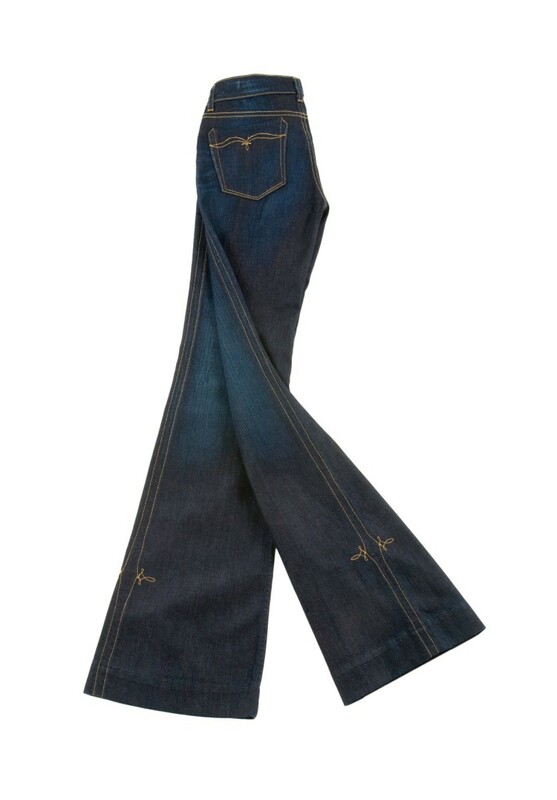 However, there is another product that might work for you called Rit Fast Fade for Jeans. You might want to check this out. I don't see a fabric softener in the box, but it might fade your jeans like the other detergent did. Rit fast fade has been discontinued some time ago. I'm bummed because it really worked and you didn't have to worry about your jeans being too faded. BRING IT BACK !! !IT WAS THE TRUE SOFTNESS I LOVED..